The Responsible Safari Company, set up by Dom and Kate Webb, is committed to sustainable development through social enterprise, reducing the dependence on the aid industry and driving tourism-generated income to rural communities through partnership. Known as 'The Warm Heart of Africa', Malawi’s nickname doesn’t just come from the country’s landlocked position east of Zambia, north and west of Mozambique, and south of Tanzania, with whose citizens the people feel a kinship, but also the welcoming hosts’ friendliness and happiness, rated top in Africa! In part for this reason, coupled with unique developmental challenges as one of the poorest countries on earth (171 out of 188 countries and territories on the Human Development Index), Dom and Kate Webb set up the Responsible Safari Company in 2008, and Orbis Expeditions, the UK-based branch, 5 years on. They work in partnership with inspiring community initiatives offering immersive learning opportunities for individuals, students & businesses to gain an insight into the key global challenges facing rural communities in Africa. Workshops take place in an environment which is hands-on and participatory, with practical subject matter including: Healthcare, Education, Environment, Climate Change, Water, Fair Trade, Sustainable Agriculture and Local Economic Development. An exceptional opportunity to gain an insight into key world challenges in ‘the warm heart of Africa’ through Global Sustainable Development programmes More details below. Malawi is a diverse country with a huge variety of ecosystems, varying from Mount Mulanje, among the highest mountains in Africa, and the high Nyika plateau in the north to the Shire River valley in the south, an extension of the Great Rift Valley. 20% of the country’s landmass consisting of water: The country is separated from Tanzania and Mozambique by freshwater Lake Malawi, sometimes called the Calendar Lake for its 365 miles length and 52 miles width, which covers about one third of Malawi’s area. It has one of the richest lake fish faunas in the world, home to some 200 mammal, 650 bird, 30+ mollusc, and 5,500+ plant species, hundreds found nowhere else in the world. Endemic animal life in Malawi includes elephants, hippos, big cats, monkeys, lemurs and bats and a great diversity of birds including birds of prey, parrots, waterfowl, large waders and songbirds. There’s tropical and subtropical grasslands, savannas, shrublands and woodlands. The climate is hot in the low-lying areas in the south and temperate in the northern highlands. Between November and April the temperature is warm with equatorial rains and thunderstorms, with the storms reaching their peak severity in late March. May to September sees almost no rainfall just wet mists descending from the highlands into the plateaus. The capital, Lilongwe, is roughly in the centre of the country. Its second largest city and major commercial centre is Blantyre, named after the birthplace in Scotland of the first European to discover Lake Malawi in 1959, the English explorer Livingston. The late 19th century saw European involvement and treaties negotiated with indigenous rulers, formally declaring the country a British protectorate called Nyasaland. A desire for independence after the 2nd World War saw federation with Northern and Southern Rhodesia (now Zambia and Zimbabwe), followed by self-governance and independence in 1964 under its new name, Malawi, declared a republic in 1966. Under the new regime, the country embarked on a programme of economic development and political neutrality in international affairs. However, the one-party government became repressive, leading to sluggish economy, foreign aid debt and Mozambican refugees, prompting discontent and human rights criticisms, resulting in a new constitution and democratically-elected pro-Western government in 1994. Malawi is amongst the world's least-developed and lowest per capita income countries in the world (just $314.50 annual average - UN, 2013), heavily dependent on agriculture (90% GDP), its largely rural (85%) population, and outside aid to meet development needs for the economy, education, healthcare, environmental protection and becoming financially independent. It is into this environment that Dom and Kate Webb bring their combined skills of hospitality, business management, education and international development, focusing on the positive impacts of tourism to deliver much-needed support to community initiatives. By choosing to work in partnership with existing community organisations supporting entrepreneurial Malawians, sustainable community development can take place. Malawi offers ideal ‘outside the classroom’ learning experiences, providing both a glimpse of behind the scenes real Africa and an all-encompassing overview of development: On the ground 'agents of change' local entrepreneurs’ inspiring examples of sustainable development help dissipate myths and promote transformational learning, combined with the diversity of landscape offering a hive for environmental research, and rural communities’ rich cultural heritage. In 1999, the estimated population was ten million, with 45 percent of the population under age 14, and 3 percent over age 65. The population is forecast to grow to over 45 million people by 2050, nearly tripling the (UN) estimated 16.7 million in 2014. Among the major diverse ethnic groups and cultures are Chichewa, Nyanja, Tumbuko, Yao, Lomwe, Sena, Tonga, Ngoni, Ngonde, Asians, and Europeans. The most widely spoken language - 60% of the population - is Chichewa, which originated among the Bantu tribes of South Africa, 30% speak Arabic, although English is taught in schools, is widely spoken and is the language of government, industry, and commerce. Malawi is a majority Christian country (82%), with a significant Muslim minority (14%), although the exact figures are disputed and data limited. While the British influence still can be seen in driving on the left side of the road, roundabouts, speed bumps, and school uniforms, Malawi’s poverty and largely small holder farming agricultural economy - 90% of export earnings, 45% GDP, supporting 90% of the population - is evident. Traditionally, homes are constructed of sticks and mud with either a thatched roof or a roof of corrugated iron held down by stones, with few decorations and cow dung often used to create the floor of the house. Cooking is done over fire in a separate building with a smoke hole in the roof and bathing done outside, often within a circular thatched shield with an open roof. Water is carried, often over great distances, for cooking and bathing. Even in urban areas, each home generally has a small plot of corn: Nsima is eaten twice a day, usually at lunch and dinner, a standard dish of boiled cornmeal, sometimes supplemented with chicken, goat or pork; Fruits are plentiful, including mangoes, melons, oranges, bananas, and pineapples. Land is treated as public domain. A person may settle on a piece of ground, build and grow crops as long as neighbours approve, and later register the plot with the government to gain legal title, thus land distribution is unequal and more than 40% of smallholder households cultivate very small plots. Export trade is dominated by tobacco, tea, cotton, coffee and sugar, with little import trade. However, foreign expat managers are being replaced by Malawians and tourism is beginning to build, with plans to restore roads and build resorts. Tourism supports local craft heritage too: The indigenous ethnic groups of Malawi have a rich tradition of basketry and mask carving, some used in traditional ceremonies still performed by native peoples. Wood carving and oil painting are also popular in more urban centres, with many of the items produced being sold to tourists. Men dress in a Western style, shirts and trousers, women often wear traditional costumes consisting of two or three chitenjes - coloured fabric used as a skirt, a headdress, and a sarong-like wrap to hold a small infant on the woman's back. The red, blue or green colour of dress represents the north, central, and southern regions, respectively. Shoes are expensive and often the local people are barefoot even in the cities. While a patriarchal society, the greater respect shown for women is one of the reasons founder of RSC Kate Webb cites as supporting the opportunity to set up a business in Malawi. However, historically social issues abound: Government corruption, violence, human trafficking and child labour have been noted, low but increasing life expectancy (just over 62 years, HDI 2014), high infant mortality, a high prevalence of HIV/AIDS (12% of the population), with at least 70% of Malawi's hospital beds occupied by HIV/AIDS patients, and 835,000 Malawians currently care for an orphaned child. - Only half of women in developing regions receive the recommended amount of healthcare they need. - Children born into poverty are almost twice as likely to die before the age of five as those from wealthier families. Malnutrition causes 23% of child deaths. - At the end of 2013, there were an estimated 35 million people living with HIV. - Malawi deforestation rates at 2.8% annually are the highest in southern Africa, exacerbating food and water insecurity. Just 9% of the country is connected to mains electricity - many hotels rely on back-up generators and/or solar power. "tourism-generated income helps build sustainable solutions in local communities". - They believe in the potential of Malawi’s people and that empowering them via tourism offers a chance to develop out of the poverty cycle. - They believe that when promoting a fragile destination you need to ensure the benefits reach the local communities. - They are committed to building the local economy in Malawi. By employing local people and creating sustainable growth through social enterprise, they aim to reduce the dependence on the aid industry. - They believe in balance. The tailored, educational and culturally diverse experiences awaken minds and inspire future generations. - They believe that everyone should take the chance to #bepartofsomething. Commitment to sustainable travel is demonstrated through a ‘Payment for Ecosystem Services’ Scheme: 1.5% of your holiday cost goes to local Malawian projects for the conservation, protection and enhancement of the ecosystems and rich culture of rural communities you benefit from during your stay in Malawi. This has so far generated in excess of $13,500 to conservation, $36,500 facilitated community donations through more than 7,500 travellers, with more than 16,000 beneficiaries. Any room in your luggage? Let RSC know and they will give you a list of resources much needed by local community initiatives which can be delivered personally or via the organisation. Experiential learning and shared experiences promote new perspectives, widened horizons and transformational learning, aligned with Sustainable Development Goal 8: Promote inclusive and sustainable economic growth, employment and decent work for all. Programmes may be taken as a group, or as a scheduled departure for independent travellers wishing to join a group. Please enquire for details. Provide practical examples of global development challenges offering maximum learning potential and hands-on experience to build awareness of the challenges faced by developing countries, working in partnership with 3 main communities as income generating activities. More details below. - The Malawi Triathlon: Cycling in the Tea Fields, Hiking Mount Mulanje, Kayaking Lake Malawi. A 9 day challenge taking on the best of Malawi. - Community Cycle Challenge: 3-5 day rural cycling. - Mount Mulanje Hike: 2-7 day hiking. - Community Development: 7-14 day community immersion. Homestay and village development. - Malawi Marathon: 3-7 Day Running/Walking. Many trips can be tailor-made to match group itinerary interests, objectives, budget and time frame, and are always accompanied by a local Malawian guide. The experienced qualified guides have a wealth of inherent cultural knowledge as well as receiving ongoing training in guiding, conservation and environmental awareness to provide support and enhance immersive learning. Groups may be schools, universities, clubs or societies, a collection of friends or family members, or businesses with an interest in immersive learning experiences on global sustainable development and citizenship. Please enquire for details. NB. RSC is committed to ensuring the benefits of tourism reach local communities and therefore has set up a Payment for Ecosystem Services scheme which contributes 1.5% of all booking value to a community environmental project in Malawi. Join a team of 10 women on this adventure and use your skills to contribute: women are the key to sustainable development in this fragile destination. Day 1: Upon arriving in Malawi, head into the country’s prime wildlife reserve, Majete, for a spellbinding evening safari experience and a night at Thawale Lodge. 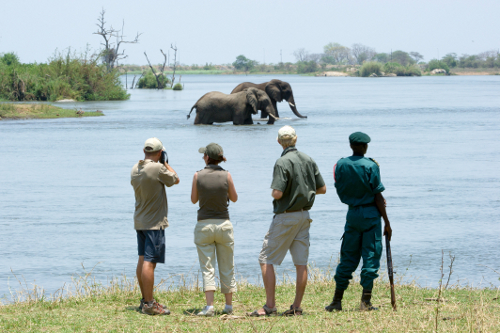 Day 2: Take an early river boat safari to watch herds of elephant coming to the banks of The Shire River to drink - or try and snap the malachite kingfishers and African fish eagles diving for their lunch. Bidding farewell to the wildlife - for now - you will transfer to the country’s tea growing region, arriving at a fair trade tea estate in time for a sundowner with sunset over the rolling tea fields. Day 3: You’ll remain based at the beautiful tea lodge and take part in the skill sharing workshops - perhaps you’ll have designed your own session, or contribute to others’, but either way you will both learn and teach! Day 4: Wind your way through beautiful forest to climb over 1000m (4-7 hours, dependent on group pace, with local guide and porters' support) up Mount Mulanje, arriving at Chambe mountain hut in time for an afternoon dip in the natural pools, and dinner around the fire with your guide and porters. Day 5: A descent while the sun rises over the mountains brings you to your driver and transfer to Lake Malawi, where you’ll enjoy the surroundings of Makakola Retreat while you put the finishing touches to your school workshops, running the following day. Perhaps you’ll share knowledge on self-confidence, STEM subjects, how to write a CV, or even sexual health and consent - wherever your strengths, confidence and passion lie. 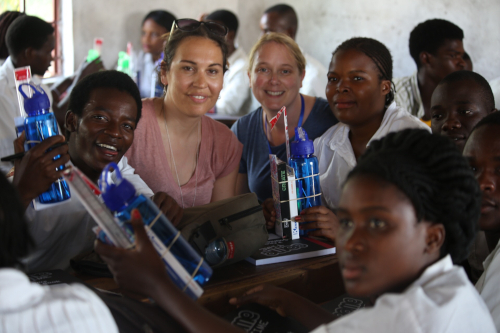 Day 6: Witness the challenges of completing education in Malawi, inspire… and be inspired. Many of the girls at the school are sponsored, from vulnerable families and often the first female to be literate in their community. Career options post school are very limited and challenge the notion of relying on a family/husband. Optional extra: 2 nights extra stay on Mumbo Island highly recommended! £515 (full board). Your journey will start at least 6 weeks before departure with planning and group video calls with your team, and continue well after you have returned home, with enduring relationships often leading to future business links and markets after the expedition. Includes: Transfers, accommodation, excursions, meals, filtered/bottled water, project set up and support, activities, air evacuation cover. Excludes: Return International Flights, visa upon entry ($75), bar drinks, tips & items of a personal nature. (£10-20/day). Feeling like the world is passing you by? underwhelmed yet overwhelmed by the average 121 e-mails and 63.5 additional notifications a day? Take some time to reconnect with yourself and your surroundings! Join the Connect Retreat, a 9 day journey for 20 like-minded leaders and entrepreneurs who will embark on an adventure of the mind, body and soul. All set against the magical backdrop of the Warm Heart of Africa, Malawi. Create lasting value for you and your business through entrepreneurial connections and discussion. Allow you time to get away from your daily stresses. Enjoy guided self reflection, relaxation, mindfulness, yoga and time for self-development. Meet similar like minded individuals and emerge yourself in local culture. Challenge yourself physically and explore the wonderful Mt Mulanje, safari at Mvuu Camp and relax and enjoy a sun downer on the shores of Lake Malawi. Includes: All transfers, accommodation, excursions, food. Day 1: Arrive into Blantyre Chileka airport, transfer to accommodation to relax and put the finishing touches to your upcoming workshops. Days 2: Skill-share with local entrepreneurs & students. Once the expedition team is finalised, your experiences and passions will be matched with relevant women and organisations in Malawi. Planning for the skill sharing day begins at least 6 weeks before departure, via group video calls - a great way to get to know your team before you travel with them! Day 3: Visit an entrepreneur hub to share your skills or a local youth group tackling families suffering from HIV/AIDS. Whichever experience you choose, you will be inspired by the determination of the Malawian people working to improve both their lives and the lives of others. In the afternoon, transfer to Majete National Park and the beautiful Mkulumadzi Lodge for an evening safari drive. Day 4: After a morning river boat safari head to Zomba Plateau and meet your homestay family for 24hrs in the village: It’s a full-on challenge in all senses, but a truly rewarding experience. Materially, life is very basic. There is limited or no electricity. It will be trips to the well for water and washing, tending to the garden, cooking food. Expect a small brick house, a mattress, and mosquito net – and a huge welcome from your host family! Day 5: Transfer to Nanchengwa Lodge at Lake Malawi and put the final touches to your school workshop preparations. Day 6: Deliver workshops at Rainbow Hope Secondary School. You’ll get a real feel for the challenges that all students - and especially girls - face. As with the skill sharing experience, planning for the workshops will begin prior to expedition departure via group video call. Though many of the students come from very underprivileged backgrounds, they are incredibly bright. Energetic, interactive tasks work best! Day 7: Deliver workshops at Rainbow Hope, then enjoy your final evening in the rustic luxury of The Makokola Retreat. Optional extra: 2 nights at luxurious off-grid Mumbo Island ecolodge: £515 full board, all activities, all transfers. Includes: All transfers, accommodation, excursions, food, and filtered/bottled water. Join Dame Kelly Holmes, back for a 2nd year, on a 3-trail running challenge! Its purpose is to raise £10,000 to support the work of Open Arms in Malawi and their commitment to preventing malnutrition in children. This is in addition to your trip cost - you can raise £1-£10,000. £10,000 will provide food for 550 Open Arms children over 12 months. You’ll take on three incredible trail runs through Southern Malawi while witnessing the beauty of Malawi’s stunning landscape from mountains to plateaus, forests to valleys and finish down at the shores of Lake Malawi. In between event days, visit local communities, take part in local sports and learn more about this years purpose; nutrition. Included in your cost is three days of community events, a wildlife safari and an afternoon spent on the shores of Lake Malawi with extension options available. Enquire to reserve your place alongside Dame Kelly Holmes today! Day 1: Arrive and welcome. Fly into Blantyre's Chileka International Airport, and transfer to your city hotel. Unwind round the pool, get to know your team and meet up for a welcome event in the evening and a chance to meet Kelly and get to know each other. Day 2: Visit Open Arms Nutrition Project - a chance to find out more about this year's purpose. Spend the rest of the day taking part in a youth sport event where Kelly will lead the training sessions and you can learn more about youth sport in Malawi. Depart late afternoon for Mulanje Mountain and your pre-event briefing wiht your Malawian Running Team mates. Day 3: 25km Extreme Mountain Run, Mulanje Mountain - run details below. Post-run, after a cool-off in the waterfalls and a barbecue lunch, there is an option to visit a number of centres which work with vulnerable young people in the area, bursting with life, creativity and talent! Day 4: Community Day and Village 5km Run. Transfer 2 hours to Zomba and spend the day visiting a youth project in a rural community. Take part in a village 5km run - the children will all follow - an amazing way to see the village and for the community to take part in the experience. They are all very fit and far more used to the heat - remember it isn't a race! Check into your hotel and have an evening briefing for Day 5's run. Day 5: 20km Forest Plateau Run - run details below. Day 6: Wildlife Safari & School Visit. Depart Zomba Plateau and transfer to Liwonde National Park where you'll be treated to the very best wildlife safari activities. A riverboat safari will take you to the very beautiful Mvuu Camp for lunch - on route there will be chance to see elephants, crocodiles, hippos, and plains game species. Transfer to Lake Malawi and visit Rainbow Hope Secondary School. Meet the students and the athletics team who will be joining you for your 3rd event on Day 7. Play a game of village netball and learn more about local village sports - be wowed! Arrive at your lakeside lodge in time for your final even briefing. Day 7: 20km Lake Malawi Trail Run. Afternoon at leisure- kayaking, snorkelling, diving, exploring. Day 8: Depart, or further travel. An early start from Lake Malawi for your airport transfer - 4 hours - and flight. Please ensure you book a flight which departs after midday. Excludes: Flights, visas ($75 on arrival), drinks, optional extra travel. You’ll be joined by a team of Malawian runners who will act as your guides, support crew and become an integral part of your team. These runners include Commonwealth Games Runners, students from a Lakeside School and a Malawi community running team. There will be water and rescue teams throughout the routes as well as a medic and nurse in case or emergencies. Day 3: Mulanje Mountain - 25km, 1060m elevation, 3-7 hours. Steep and rocky. Rise early to beat the heat of the day. Meet up with your Malawian Running Team. The endurance challenge starts around 6am. The terrain is rough, the route very steep and you will rely heavily on your Malawian running guies to lead you over the rocky paths and safely down. To prepare: Head off road and do lots of hill training on rocky terrain where possible. Day 5: Forest Plateau Run - 20km, varying terrain. 2-4 hrs. Plantation tracks, steep rocky descents. Meet your Malawian Running Guides and head up into the hills and tracks of Zomba Forest Reserve. The climate should be slightly cooler than Mulanje and the easier terrain means in parts you can get into your stride and enjoy the run. Do expect slippy, rocky tracks- particularly on the descent. To prepare: Contact a 2018 challenge participant for insider info on the terrain. Day 7: 20km Lake Malawi Trail Run - Varying terrain. 2-4 hrs. Sandy tracks, hilly terrain, villages. This will be the hottest climate during your challenge in Malawi with temperatures edging towards 40 degrees so the event will start at dawn. The route is largely tracks with undulating landscape and sandy paths at times. Your run will begin and end in Chembe Village so be prepared to be joined by lots of children - they are fast! To prepare: Make the most of hot days at home and head out to acclimatise to running in the heat. Day 4: Rise early and pack up the hut before setting off across the plateau - witness the beautiful landscape of Mulanje before starting your descent stopping on route for a picnic lunch and swim at the waterfalls. Arrive back at base camp mid afternoon (FB). Day 5: Depart Mulanje and drive 2 hrs to Zomba Plateau. After lunch pack a small overnight bag and head into the village to meet your homestay family. Help prepare the evening meal before settling in for the night around the fire. (DBB) Bottled water, mattresses and mosquito nets will be provided. This night spent within traditional Malawian family village house supports SDG#1 No Poverty / SDG#2 Zero Hunger and learning about youth and rural literacy (SDG#4 Quality Education / SDG#5 Gender Equality). If you would prefer to just arrange a day visit, alternative accommodation can be arranged close by. Day 6: Rise early to the sounds of village life. Join your family for their morning routine collecting water, working in the garden. Meet the local youth group for a village walk and farewells. Depart to Liwonde National Park arriving in time for an evening 4 x 4 Game Drive (DBB). Day 7: After breakfast head out on a river boat safari, is a fantastic opportunity to see herds of elephant drinking on the banks of the river! Relax at camp before sundowners and an evening 4 x 4 Game Drive (FB). A day to learn about learing about SDG#15 Life on Land and SDG#14 Life Below Water! Day 9 & 10: Spent working on community activities, tailor-made to your interests if you wish, for example: mentor in a secondary school seminar format, planned with the head teacher and local youth group; join and help the local primary school; Join a family to prepare a traditional fish lunch; Run a mini olympics challenge at the school; Work with a local entrepreneur to create a website. Plant seedlings at the community environmental centre; Lead a reading session at the library with pre school children. Help with homework club... Each visit to a partner community acts as an income generating activity - the cost included in your package. Community activities can be done as a whole family or you can choose to split into parents and children or mothers/daughters, fathers/sons etc. NB. Swimming in Lake Malawi does carry the risk of contracting Bilharzia. Domwe Island is tested annually and in recent years there have been no positive samples that show the parasite causing bilharzia is present in the waters surrounding the island. However, if you are concerned alternative accommodation in a larger hotel with a swimming pool can be arranged. Day 14: Transfer by road to the airport (30 mins) and connect with your international flight. Overall, your tourism can help SDG#10 Equality and support (SDG #16) peaceful sustainable development through your tourism's partnerships for the goals, SDG#17. Inclusions: All Accommodation, meals (where stated) All Transport (inc. fuel & driver), RSC Guide, All Project set up and support, All Activities (where applicable), Air Evacuation cover, All local Taxes and Bank Fees. Exclusions: Return International Flights, Meals & Activities not included, Personal Travel Insurance, Visas, Bar Drinks, Tips & Items of a personal nature. Designed to follow a model of sustainable development to educate and engage on vital issues affecting the world today. Choose an all encompassing overview of development or an in-depth focus on one or two areas, including workshops on Wildlife, Environmental Conservation, Healthcare, Education, Business and Fair Trade. Includes: Return International Flights, All Accommodation, All Transport (inc. fuel & driver), RSC Guide, All Project set up and support, All Activities (where applicable), Air Evacuation cover, All local Taxes and Bank Fees. Excludes: Meals and activities not on itinerary, Personal Travel Insurance, Visas, Bar Drinks, Tips & items of a personal nature. Workshops are hands-on and participatory. Experiential learning and shared experiences promote a fresh attitude and new perspective, widen horizons and promotes transformational learning, leading to improved skills such as communication, adaptability and leadership. Ideal for groups interested in sustainable development. Health & Well Being (Sustainable Development Goal #3) Healthcare: Learn about the work of a local NGO, Malaria, Bilharzia and Malnutrition and create arts with a community volunteer, to raise awareness of a key rural health issue. Village Home-based care: learn about village healthcare provision, and work alongside the team visiting and supporting families. 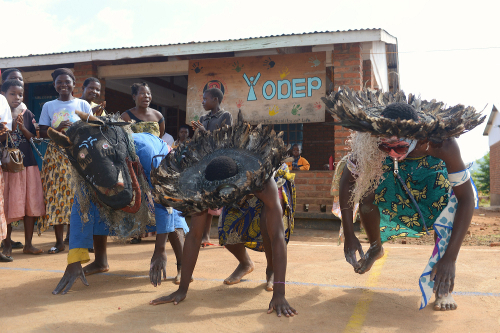 HIV: A look at how Malawi is responding on a local village level in healthcare and education. Malaria: Learn about the Malawi Liverpool Wellcome Trust malaria prevention team’s work. Environment: Learn about SDG #15 Life on Land, SDG #14 Life Under Water and SDG #13 Climate Action. Land Use: On Mulanje Mountain, hike and learn about the flora, fauna and effects of deforestation, irrigation systems, soil erosion, agriculture, water, conservation and climate change. Natural waterfalls nearby provide a refreshing swim. Forest: In Malawi’s last remaining rainforest, join a local Community Based Organisation on sustainable use of resources, conservation, natural spring water supply and patrols. Permaculture: Learn about sustainable crops, permaculture, nutrition, small holder land use and natural remedies at a social enterprise in Blantyre. At Lake Malawi: A workshop with a NGO learning about sustainable fishing, fuel efficient stoves, deforestation and tree planting initiatives. Social Entrepreneurship & Sustainable Practices: Learn about SDG #12 Responsible Consumption & Production, SDG #9 Industry, innovation and infrastructure, SDG #8 Decent Work and Economic Growth and SDG #17 Partnerships for the Goals. Fair Trade: Visit Malawi's oldest and most beautiful tea estate in Thyolo, learn about one of Malawi’s key exports, its sustainable practices & fair trade & take part in tea tasting. Sugar Production: Visit Malawi’s leading cane sugar producer to see the process from plant to packaging and the fair trade methods used to ensure production is sustainable. Sugar Cane Cooperative: How a small fair trade cooperative of subsistence farmers works under a centralised irrigation system and agronomy. Small Holders: Visit a family using their land to grow coffee & learn about Local Economic Development, market access for small holder farmers, picking, grinding & packaging. Local economic development: Learn about income generation and get your hands dirty with community-based organisations’ initiatives like paper-making (from elephant dung and banana leaf! ), tailoring and chicken rearing. Water and Sanitation: Learn about SDG #6 and SDG #11 Sustainable Cities & Communities. Sugar Production: Learn about irrigation systems, soil erosion, conservation, and agricultural land use and water. Visit Kapichira Falls, Majete Wildlife Reserve: A river fed hydro-electric dam. Take a river boat safari to witness the importance of The Shire River to the reserves flora & fauna. City Waste Management: Meet an international charity working with the government to tackle water and sanitation and (for the strong stomached) take a toilet tour of Blantyre! Clean Water Initiatives: Learn about the challenges of accessing clean water on the shores of Lake Malawi and visit the village boreholes and pumps. Education and Cultural Immersion: Learn about SDG #4 Quality Education and opportunities for all. Malawian culture, heritage and history: Mua Mission Cultural Museum is dedicated to preserving, recording and researching Chewa, Ngoni and Yao culture. Watch local traditional carvers create beautiful wooden pieces. Education: Learn about the challenges facing rural families for access to education and visit a village primary school and Early Child Learning Centre. Religion: Learn about the role it plays in the lives of young Malawians and attend a guide’s local church service. Women’s Empowerment: Take part in a village banking initiative which aims to empower women by offering small village financed loans, supporting SDGs #5 Gender, #10 Reducing Inequalities and #1 No Poverty. Dancing: Watch a local village dance group as they show you their traditional performances to celebrate the key events in their lives. Cultural Village Homestay: Experience life living within family and village setting, take part in daily activities and learn about some of the complexities mixed with simple joys of village life and implementation of the UN Sustainable Development Goals for sustainable communities. Global Citizenship Programme: from: £1,895pp *Based on 10 people. Bespoke trips designed to help educate young people on vital issues aﬀecting the world today, prior to taking their place as global citizens. Covers key developmental challenges facing rural communities in Malawi, cultural identity and how this influences sustainable development, and supports the skills and confidence to teach others about global sustainability issues. Each trip is tailor made to ensure the itinerary suits your groups interests, objectives, budget and time frame. Local guides accompany every Trip, enhancing students’ immersive learning experience, providing support throughout your time in Malawi and becoming an integral part of the group. Outside The Classroom: Kayak to a Robinson Crusoe Island on Lake Malawi; Wildlife safari, rising at dawn to track protected black rhinos; Experience Malawian culture and cuisine on a homestay initiative; Build lifelong cross cultural connections with your local guide; Experiential learning widens horizons and promotes transformational learning, leading to improved skills such as communication, adaptability and leadership. Includes: Return International Flights, all accommodation, all transport (inc. fuel & driver), local guides, all project set up and support, all activities (where applicable), air evacuation cover, all local taxes and bank fees.Excludes: Meals not included, activities not included, personal travel insurance, visas, bar drinks, tips & items of a personal nature. Enquire for bespoke group trip development! From: £1,200pp *based on usual group size 10, but can be operated with smaller group sizes on application. Cycle, hike, run, kayak and sail and take on the best of Malawi, experiencing its communities and culture as you go. Bespoke group trips available: Enquire to discuss. Dependent on bespoke itinerary. Ethiopian Airlines, Kenya Airways & South African Airways provide flights from UK to Malawi via respective hubs; Addis Ababa, Nairobi & Johannesburg. For group bookings of more than 9, flights usually can’t be booked online - our partner will work with specialist agents upon confirmation of trip to secure the best option and rate flights and organise all local transport logistics. 2012, 2009 2 star eco-certification from Sustainable Travel International, the first company in Africa to receive this recognition. 7 days: 100% of trip cost. RSC holds comprehensive International Public Liability cover in both Africa & UK; International Passenger Liability on all seat belted vehicles; Comprehensive Air Evacuation cover through Global Rescue; and is in the process of becoming ABTA registered and fully bonded in the UK. Risk Assessment Management Plans (RAMP) are updated annually and RSC also hold a professional Emergency Operating Manual compiled through an official Emergency Response organisation. RSC is based in Malawi and offers 24 hr support to all visiting groups.